1. Please keep the micro USB cable dry. 2. Do not use your device while charging. 3. Make sure the micro USB cable fully inserted into the device when charging. 4. For three months after the date of purchase, we take care of all quality-related issues with a REPLACEMENT or REFUND. If you have any question, please feel free to contact with us! Universal Compatibility: Support most Android Tablets, Cell Phones, and Windows Phone which with Micro USB port, such as Samsung Galaxy S3/S4/S6 Edge S7, Note 4/5, HTC, Motorola, Nexus, Nokia, LG, HP, Sony, Blackberry, MP3 and other Micro USB compatible devices. Nylon Braided: Tangle-free nylon braided coat cover with sturdy ultra compact connector can bear 4000+ bending test, and increasing durability extend the life of cords long. 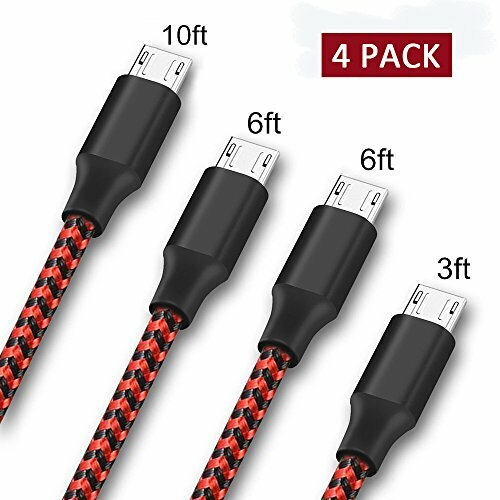 Diverse Length: 4 pack micro cables in different length are ideal for usage while charging in home, cars, office travel and more. Durable: Compact stainless steel connector heads slot in easily but securely and fit most devices..
Service and warranty: Worry-free 90-day warranty and friendly customer service. Pls contact our support team at the first time if you had any question. If you have any questions about this product by TOPBIN, contact us by completing and submitting the form below. If you are looking for a specif part number, please include it with your message.